Black Friday is upon us and let all da Christmas music, lights and festive "gestures" begin! Before you all buck-a-loose, I just wanted to say Mahalos to all those who tune in daily, weekly, monthly wat have you and I sincerely do appreciate it. A BIG Mahalos goes out to those who brave da "wrath of Kwon" (pun for those Trekkies out there) by sharing your comments and scoldings. WWD! isn't perfect - nor do I claim it to be - but it's just a stocky little braddah sharing his classic misfortunes for those to laugh, shake their heads or just wonder along saying...... Wassup Wit Dat! So to all those - especially those who have hung around since da inception - I truly am blessed to have you in my "internet" life. Naturally besides being thankful for all our ohana, wat are you thankful for? Have you been a fortunate recipient of good luck which has made you more "thankful" for something you oddahwise wouldn't have been able to? Wat are you most thankful for recently? If you see me in real life, no scade say wassup cause I no bite..... especially if you're carrying beer. Happy Holidays and spock you out next week, next month, wen evah! For those who are "traditional", wat are your plans for tomorrow? Are you da cooker? Da eater? Da "Al Bundy" couch slouch? Da football whore? Da go outside and play, come in to eat, go back out to play? Da volunteer? Da chillaxer? Da spock out all da ads you can and plan your route shopper for da madness person? By da way, I've always wondered wat people cook too? Are you da traditional turkey, stuffing and gravy holiday cooker? Have you done turkey variations like fried, kalua or bbq? Does a special stuffing make its way to da table? Or maybe a special dish dat only comes out during da holidays? Stay safe out there and enjoy da company around you. Da weather is fantastic - a nice crisp feel - and it totally gets everyone into da mood for da holidays. It's awesome to look up and see baby blue sky, high to no clouds, da shining sun and wispy cool air gracing your face. Lucky we live Hawai'i, lucky for ohana to share it with - hopefully dis "luck" continues its ripples through da next few weeks of madness. We've all had to be one at one time or anoddah but wen was da last time it was shoved down your throat? 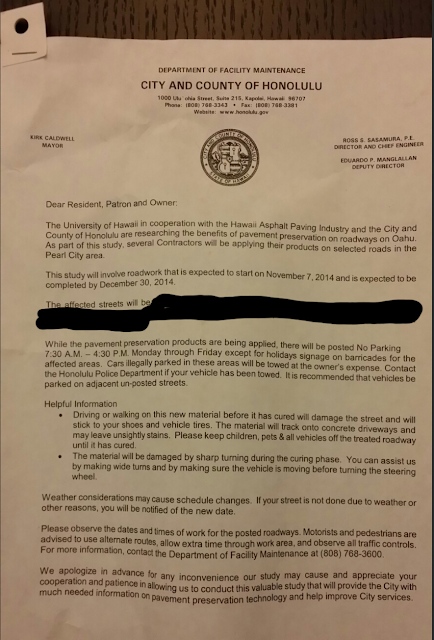 In case you nevah read da notice, it basically said C&C (City & County of Honolulu) - in "cooperation" with oddahs - was going to lay down road surfacing products to "study" pavement peservation. Only a two month open waiting period? Why not three? Heck, why even give us a range?? Wow, C&C coordination at it's best - HPD will be there lickety-split to tow your ride wen it took them nearly three years to bust down the drug house three houses away. So how long does da curing process take? Will the street be closed? Wat happens if our driveway does get stained by a product we don't even know is being applied to our street at watevah day/time we don't know about? If that's the case, are you going to shut down the street? Oddahwise, how can you expect vehicles, pets and children to stay off of it? Then, are da fumes harmful? Are there safety precautions we should take like not leaving our windows opened? Are we able to just wash it off with soap and water if we happen to get some flung on us? And wtf are you guys laying down product dat has da potential to cause harm and not even say wat's being used? Then why da heck are da streets left opened??? Why da heck do it on public streets with a possibility of damage and unknown harm if it's just a study? Are our vehicles and lives dat insignificant? Why not lay da product down in a C&C parking lot, close it for 24 hours to "cure" then reopen it? How's about a section of road at UH, LCC or KCC during winter break? I mean there are countless oddah "safer" more adaptable venues than populated housing areas. You tell me, how da heck do you respond to dis "order"? Forget it being a C&C owned road and all da legalities of it, do you even believe dis method is pono? How da heck can you "experiment" and not even divulge wat's being used? They got me by my olo's too. Wat Da Heck Is Wrong With People? In dis day and age of evah changing "social media apps", it's absolutely amazing how an app can cause - instigate - so much pilikia. Amazing aside, it's frickin' ironicly pupule how a scheduled assembly on bullying got canceled because it was, well, bullied. Das wat happened at Kaiser High School today. A scheduled assembly to obviously share information about bullying was to happen today, Friday, but wind of a new app called Yik Yak (nevah heard of personally) was found to have threatening remarks yesterday leading to da cancellation of da assembly. How much more messed up can our society be to have dis kine of stuff happen in high school? I've witnessed dis kine stuff in college during mid-terms and finals (bomb threats just so dat ONE idiot could have an extra day or two to cram) but c'mon, in high school?! You gotta be kidding me! And we all wondah why bullying is such a hugemangeous problem dat no one is affected by until they are directly affected - or personally care - about it. Da app has all kine's of "features" dat I no like even get into but it's a scary app from da details I've read and it's all ANONYMOUS. It's so frickin' sad dat we as a society have no responsibility for each other yet alone for ourselves. But I'm sure there'll be an app for dat. It's behavior multiplied by their environment dat creates and grows dis kine of breed and until we can culture da environment, behavior will nevah change. For da dwindling population of those who still care (all da WWD! Hui) - continue to share da aloha, persevere and continue to do da right thing as much as you possibly can. There will NEVAH be an app for dat. It's more a guy thing but anytime a guy heads into da "office" - aka bathroom - his throne is wea "business" takes place, specifically numbah 2 action amongst oddah things. 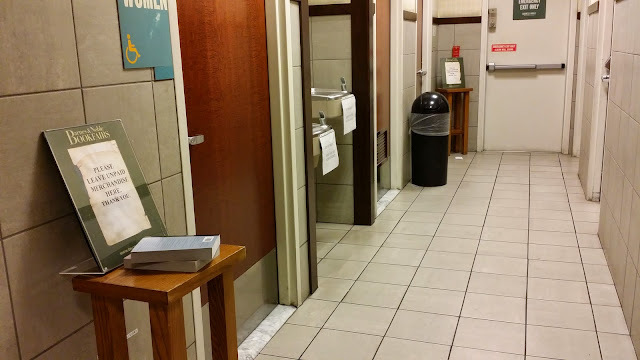 All it reminded me of was da Seinfeld episode (yes, I still love those Seinfeld-isms) wea George had to go numbah 2 and needed "something" to help occupy his time and latah was forced to buy da book cause it was in da bathroom. 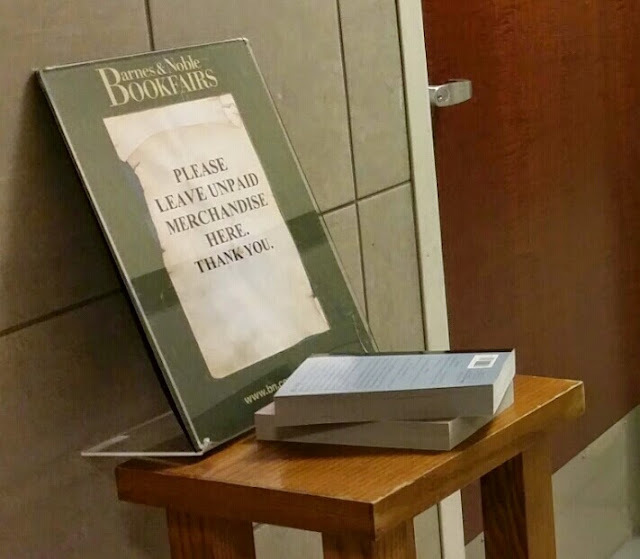 But I was still tripping out dat Barnes & Noble had to put signs out there to let their customers know not to take merchandise in da bathroom. Besides da shoplifting angle, wat kine people would make "house" li'dat? Obviously B&N has witnessed such actions but c'mon people, you do it in your own hale, not in a store especially with merchandise you may just be checking out instead of purchasing. Bookstores have literally replaced libraries since now every store has a cafe or coffee shop attached to it and many people just "borrowing" books and magazines as they caffeniate away since libraries don't allow for it. But really, is there much difference between sitting down at a table/aisle with possible food/drink spillage, saliva (licking fingahs to turn a page) or hannah-battah transfer compared to da office? I guess it's really a pick your poison kine of thing. Although you'll nevah admit, your grin says it all.